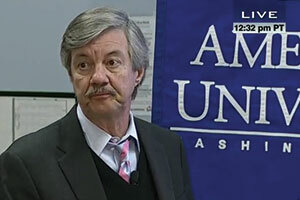 Many people know Ron Elving as NPR’s senior Washington editor and correspondent, but at American University (AU) students know him as “professor.” He has been named a 2016 Outstanding Teaching in an Adjunct Appointment for his work at AU School of Communication. Elving can be heard daily on NPR exploring the shifts in the political landscape and predicting campaign strategies this election season. On campus, he joined SOC as a Visiting Distinguished Journalist in 2014, and is currently teaching How the Media Shapes History as an adjunct. In fall 2015, he taught Understanding Media, an introductory level course that allowed students from across the university access to his experience and knowledge. “Professor Elving is precisely the kind blue-chip professional we value in the journalism program. Not only has he done what he is teaching our students to do, he has done it as recently as this morning,” says John Watson, the director of SOC’s journalism division.